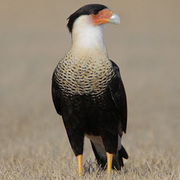 Sightings of Crested Caracara in the Pacific Coast states were long considered suspect due to the possibility that they represented birds escaped from captivity. However, a recent upsurge of records has led to a reconsideration. The Washington Bird Records Committee has now accepted three records as "wild" birds: Ocean Shores (Grays Harbor County) in August 1983, Neah Bay (Clallam County) in January 1998, and Oakville (Grays Harbor County) in May 2006.